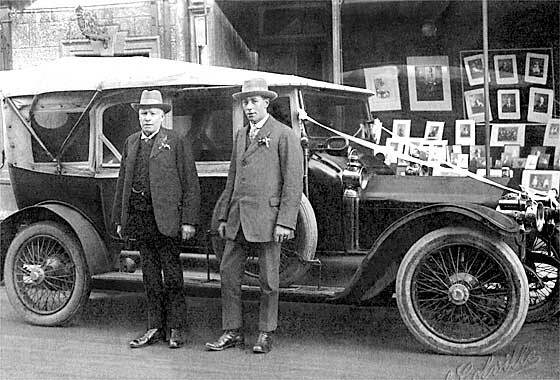 Photo sent to us by Kay Pittelkow (Australia) taken in 1908 Yorkshire of a car possibly owned by great grand uncle Walter Graves. -- Probably not! This is very likely a photographers "prop" (no reg) and could well be same car as on Help Page 16. The car is a cca 1899 Daimler Kimberly 4HP Tonneau. Car has a weird black box around the front axle, possibly 'dark room' or tripod store. Tyres appear flat and there is a sand 'ramp' by rear wheel. No tyre tracks to indicate how it got there. 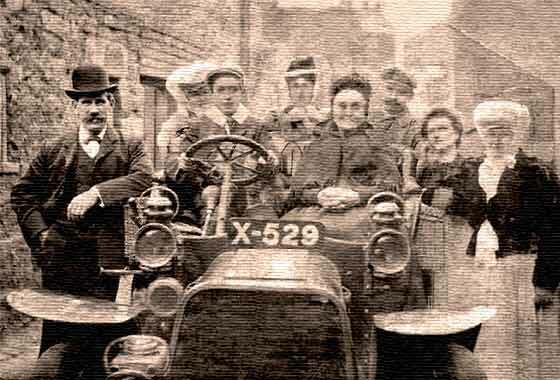 Period photo sent in by Richard Wheeler (UK) asking if we can identify this car he found while trying to investigate late father's family history. Is it a steamer? -- Although it has an American look due leather apron, it has De Dion type wheel hubs. Our expert Rory Sinclair has immediately identified it as a 1900 De Dion Bouton Vis-a-vis, a 3.5hp Type E or a 4.5hp Type G1. The apron is a period mod, front seat could be made to face either way, and hinged footboard can be folded back. Another cinema screen grab of a vehicle which appeared in an Italian Film " Fumo di Londra" (Smoke over London) made in 1966, where the vehicles are being investigated by IMCDB. The plot involves an Italian man in love with British culture and lifestyle. His dream is to come to 'swinging London' and live like a typical Englishman -- This is a cca 1900 English Mechanic. Cars were home made by their owners from plans provided by the magazine 'English Mechanic' based on Benz Velo. 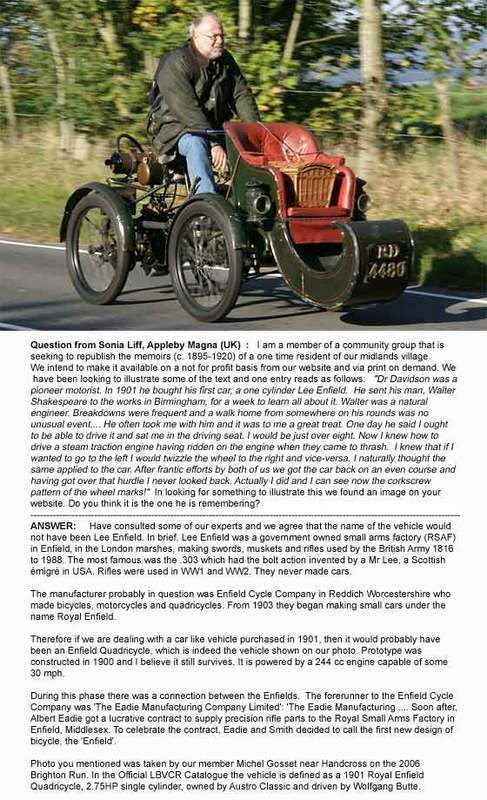 Request sent to us by Sonia Liff of Appleby Magna (UK) who are doing web memoirs of a villager recalling a Dr Davidson who in 1901 bought his first car, a one cylinder Lee Enfield. Could they use our photo to illustrate type of car. -- Not Lee Enfield as they made swords, muskets and rifles. Manufacturer probably Enfield Cycle Company in Reddich, Worcestershire who made a 1901 Enfield Quadricycle with 244 cc engine good for 30 mph. Photo is 2006, of a regular Brighton Runner. Period photo sent in to Rootschat by Ambleetc (UK) asking if anybody can help him date this photo? -- The registration is Northumberland County Council but dating data has been lost. 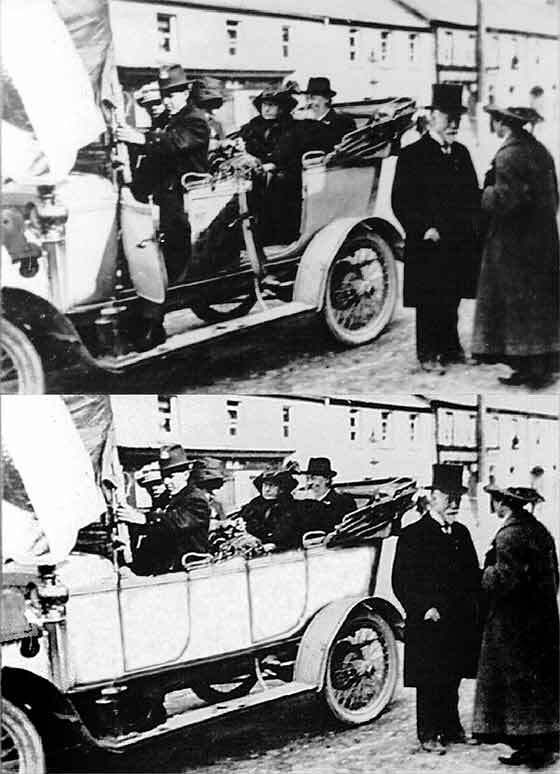 Confirmed by ex Darracq owner Rory Sinclair that it is a cca 1905/6 Darracq Tonneau, 2 cylinder 12hp Type R. The vertical gilled tube radiator with thin brass surround is 1905 or later. 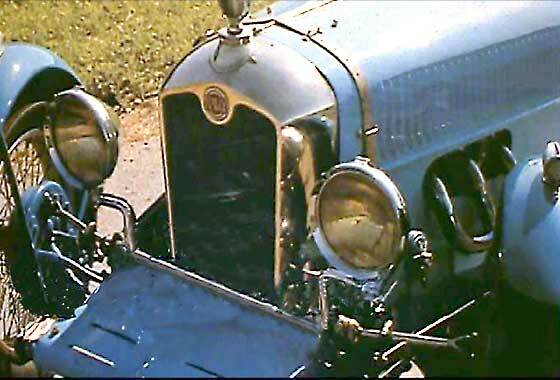 Famous "Genevieve" Type O, has incorrect honeycomb radiator copied from Type P 'Flying Fifteen' Darracq. Photo poss 1908. 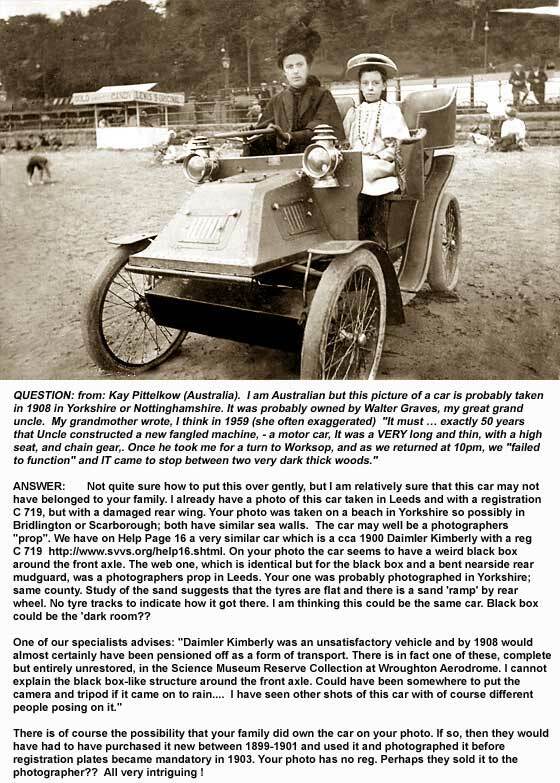 Lovely photo sent in by Simon Beer (UK) doing some family research and has found a photo's of his grandfather's first car. He was a doctor and served in the first world war, so its probably from around that time. 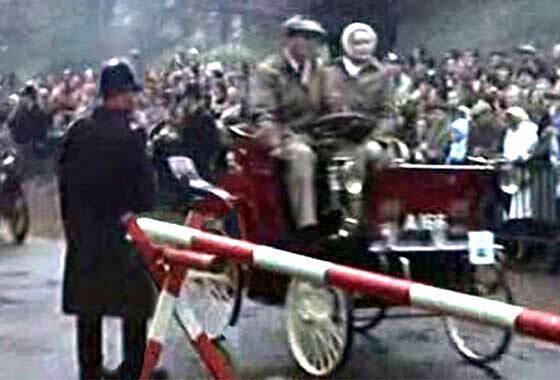 It seems he never learnt to drive relying instead on being driven around by his wife, - she learnt to drive in 1916. Identification of car has so far eluding Simon. -- The car is a cca 1911 Rover 12 Tourer. A sundial is in front of the numberplate, so dating and region cannot be confirmed. Photo sent to us by our French Member, Michel Gosset (UK) of a photo hanging in a pub in Toys Hill, Brasted. It is headed "Lord Weardale's car, said to be the first motor car to use Chart Lane". 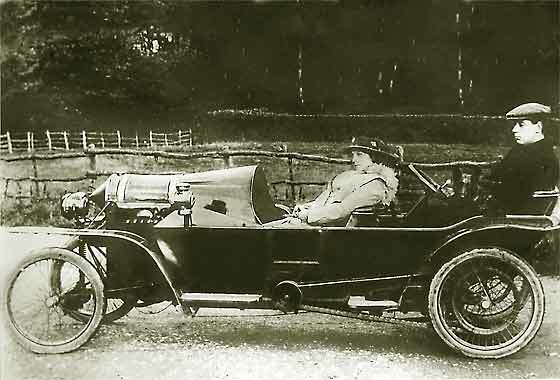 -- Photo shows a French cca 1913 Bedelia Cyclecar. 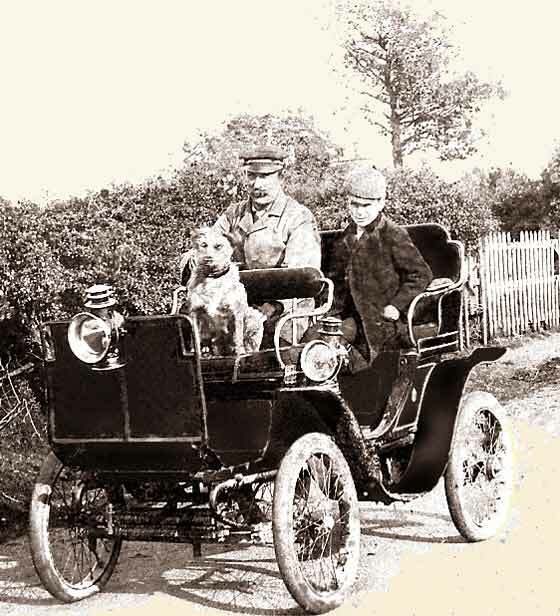 It is unlikely no other vehicle had been along the lane pre 1913 and, - as this was a sporty but relatively inexpensive machine, was unlikely to have been their only car to be seen in. In 1906 he built Weardale Manor of 145 rooms for summer use. 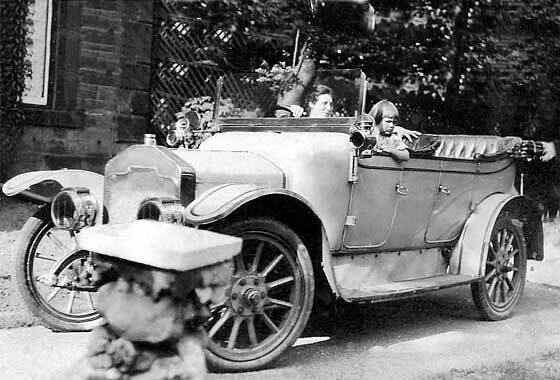 Photo sent in by Esmond Morgan, Northamptonshire, (UK) asking if we can identify the car in the attached family picture. The photo is of two members of his mother-in-law's family. Mother-in-law is now 91. Esmond believes they used to run a wedding business. 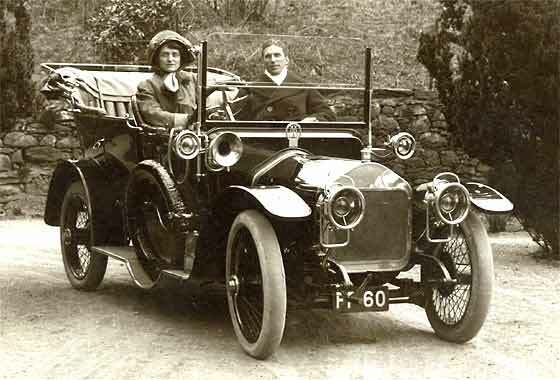 -- Can advise that the car is cca 1912/13 Wolseley Tourer, probably the 16/20 Model. Wolseley were in the sheep shearing machinery and had Herbert Austin design the first cars, later Siddley, and taken over by Nuffield in 1927. 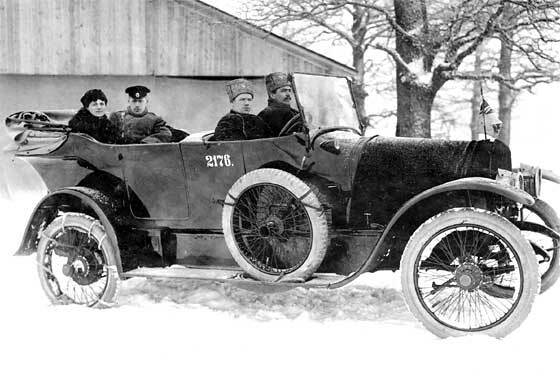 Two photos sent in by Tom Hope,Toronto (Canada) of grandparents in a WW1 staff car. He was a colonel in the pre revolution Russian army fighting on the Eastern Front circa 1915-1918. Enquiry to Crossley website asking if Crossley. They said no and reticenced on suggesting others because of the blanket on the bonnet. -- I am going out on a limb and think that the car is a cca 1912-14 Benz. Side light windscreen chain cover etc. Tyres support the Russian connection being Treugolnik. Photo sent in by Patrick Kennedy (USA) asking if we can identify this car. Great Grandma Rosa Beal photographed at their property in Unionville MO. USA. The story is, that this car was bought to get back and forth from Illinois to Missouri but they never said what car they bought, only took a photo! -- Our Friend Chris Poulsen at the AACA pointed us in the right direction so we can confirm this is cca 1916 Overland 81 Touring 4 door. Length of bonnet suggests model number. Photo received from Paul Leopold from Worcestershire (UK) of his grandfather's car in Holloway, North London. He had a Humber and a car with a "dicky seat". Another uncle had an open top Bugatti. -- Not either. 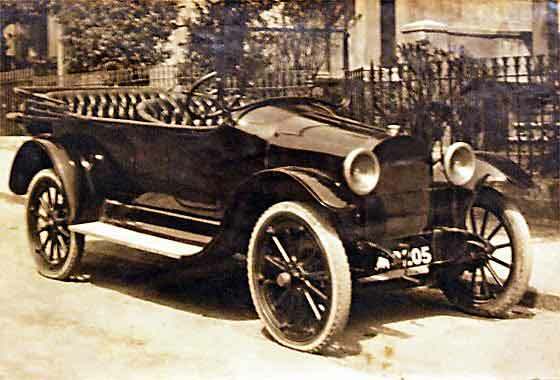 This is an American mid range tourer 1917-21. Fuzzy photo without rad badge. Looks Buick-ey as no external door hinges, partially covered springs, correct wheel nuts etc. Our John Warburton spent a few hours and has put his money on a ca 1917 Buick Model D35 Touring. Photo sent in by Bruce Cox (USA) asking for possible identification. His Grandmother Anita Tilley is the passenger and the driver is Joe Browne. It appears from her age that this was taken in about 1928 and photographed in Washington D.C. " You web site is wonderful. Thank you for sharing your expertise." 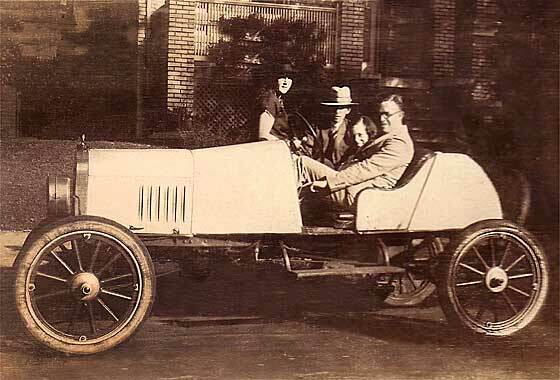 -- This is another 'special' and a very similar car to the other Raceabout on this page, being a cca 1922 Ford Model T Raceabout. It is a little difficult to be precise about the dating. cca 1922 Ford Model T Raceabout. It is a little difficult to be precise about the dating. Photo sent to us by David Harrigan (USA) of Jerry Houlton's father when he was mid 20s. 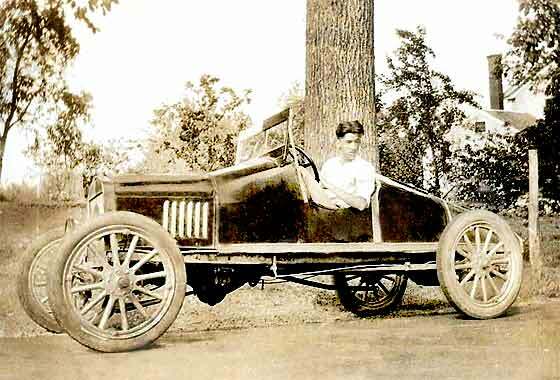 Jerry has always wondered what kind of car this was. "Home-made"? Any ideas? -- Body is indeed home made and looks well finished. 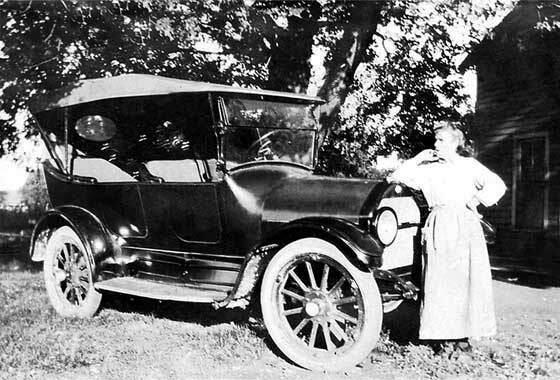 With transverse spring, rounded bonnet and six louvres, it is a Model T, 1916 to 1926. Our AACA friends have narrowed it down 'front wish bone below axle and small drum rear axle, '19 to '25. Short of any other info, its a cca 1923 Ford Model T Raceabout Special. Another cinema screen grab of a vehicle which appeared in an American film " The Betsy" made in 1978, where the vehicles are being investigated by IMCDB. The plot involves a family automobile manufacturer who pin their hopes for a return to profitability on a new model. Said to be based on some members of the Ford family of Detroit; obvious parallel is apparently Olivier playing a Henry Ford like character. -- This car is a cca 1925 Rally Sports Cyclecar from France. Photo sent in by Colin Palmer saying his father once told him that he had a Bebe Peugeot in Shanghai. Could this be the Car? -- Sorry, NO. 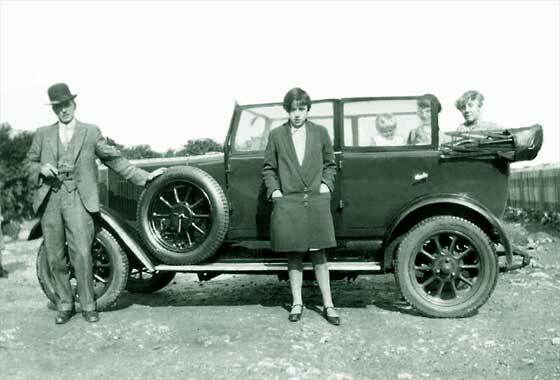 Looked Morris so forwarded by our Chas Moody to Peter Seymour of Bullnose Morris who said it was a cca 1926 Morris Cowley 'Occasional Four', or 'Chummy'. The Chummy was made in small numbers from 1923 to 1926. Survivors are rare. Two basic inwards facing fold-down rear seats which if folded up provide a good space for luggage. Bigger tyres. 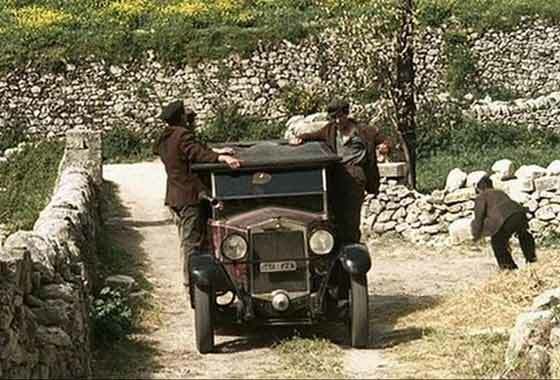 Another cinema screen grab of a vehicle which appeared in an Italaian mini series "Il Capo dei Capi" made in 2007 where the vehicles are being investigated by IMCDB. The complicated plot involves a mafioso from Corleone, Sicily. 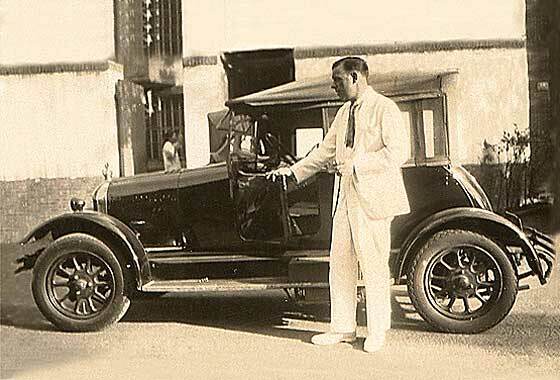 -- This car is a cca 1927 Fiat 509a Tourer. The 509 announced in 1924, replaced the 501 in 1925 and spec changed to 509a in 1926. At the end of the production run in 1929 over 90,000 cars had been built including sports models, taxi cabs and commercials. Photo received from Mr. D. Oakley (UK) to which he is trying to put names to the people. Year of the manufacture of the car would be most helpful. -- Confirmed by our Morris expert Chas Moody as a cca 1927 Morris Cowley Tourer. These cars were known as 'flatnose' because they followed the famous range of 'bullnose' Morrises. Flatnose rad commenced in September 1926. Three-stud wheels differentiate the Cowley from the similar but more expensive Oxford. Pre August 1928. Interesting enquiry received from an insurance company requesting assistance in identifying a vintage truck which had burnt out and for which they received a claim. Claim indicated it was a 1926 CF4. 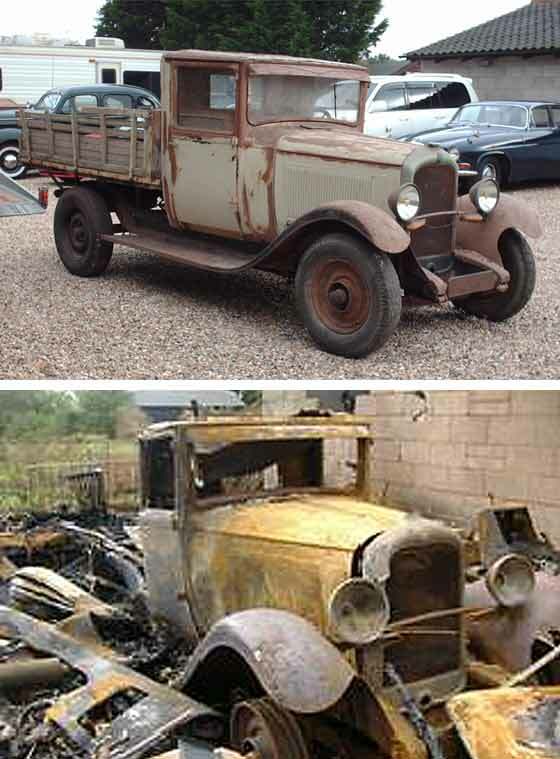 -- While this is not what we normally get involved with, we were able to advise that the damaged car was a cca 1929 Citroen C4F Camionnette, one of the first upgrades to the AC4 range, 1928-1930. This suggests that the import documents did not have the right build date, - not very unusual. 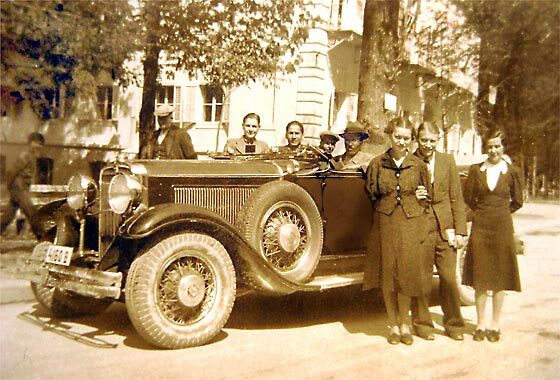 Photo received from Adrian Pascu-Tulbure (Romania) taken in 1939 Romania. Adrian thinks the car is American. A friend thinks it is a Buick but Adrian thinks it is a Lincoln without the Lincoln bumper. -- Actually it is neither. Our friends at the AACA have nailed it down as a 1930 Nash Touring Twin-Ignition Eight. Nash's first 4-door convertible, priced new at $1,795. The front wheels were set slightly narrower than rear. Founded 1917 and named after founder, who also purchased Rambler. 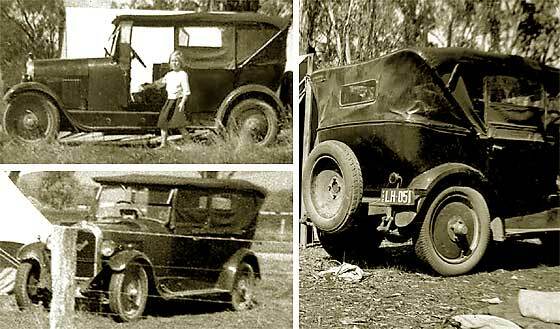 A series of four photos sent in by Lindsay Crawford (Australia) saying he is trying to identify one of his father's early cars. Photos are dated late 1949 judging by the ages of the kids. Taken on camping holidays in Victoria, Australia. -- Lovely photos great on views but tiny on the car. When blown up, the pics are a bit blurry and thoughts it was American. However our Antipodean friends suggested European by smaller size wheels. Closer study identifies it a French cca 1930 Citroen B 14 Tourer. Article sent to us by Nigel Matthews, Vancouver, BC, (Canada) about a 1932 Model "A" Ford built for Gordon Beuhrig, the Duesenberg and Cord designer. Why was this car fitted with a UK licence plate? Could we date registration. -- YE series was London County Council January 1927. The car was seen at a Hollywood studio, so number for a film? Or unlikely, a genuine plate of 27 kept as a 'cherished number'. Photo shows the car on the right side of the road. In the UK, if genuine, it would be on left. 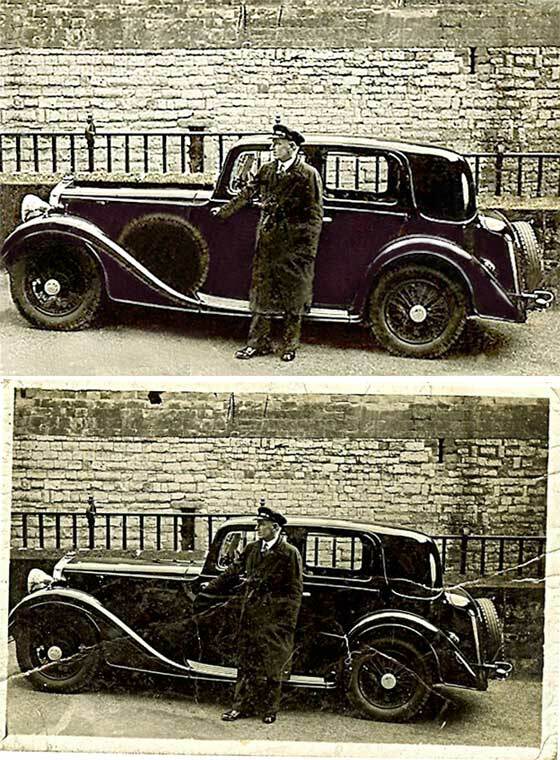 Damaged photo sent to Rootschat by Brian (UK) of his grandfather standing next to a car outside the Crown Courts at Caernarvon. Would it be possible to repair the photo? -- One of my hobbies is photo restoration. The Car is cca 1934 Lanchester 18 Model 317 with a Mulliner coach-built body. Fredrick Lanchester was unique in not copying any car designs but starting at first principles. Gas engines in 1889, first car in 1895. 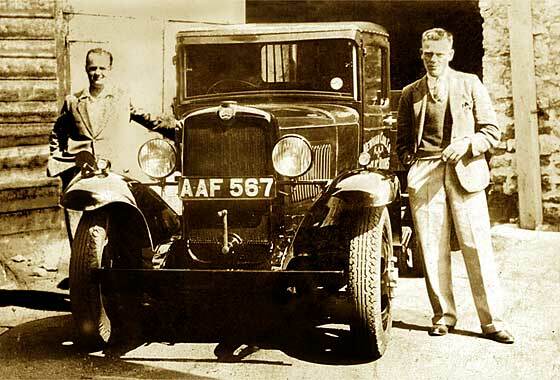 Amalgamated with Daimler in 1931, - who were owned by BSA. 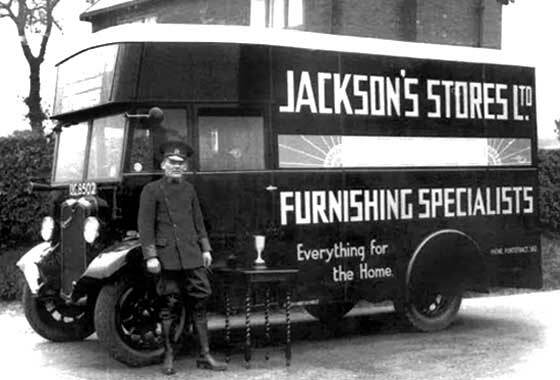 Lovely photo sent in by Paul Dobson (UK) of his grandfather Walter Dobson who was a driver for Jacksons Stores Ltd in Pontefract, West Yorkshire. They no longer exist. He knows that the reg UG 8502 was issued in Leeds area but he cannot identify the vehicle make. -- We can confirm that the reg was issued by Leeds CBC in about April 1934. The rather smart vehicle is therefore a 1934 Commer Box Van with a forward control body, probably a Centaur or perhaps a forward Raider. Photo sent to us by Bill Johnson (UK) of a small lorry which at the time was owned by Newham Coal Co., of Truro Cornwall. Can we supply any information on the Make, Model and Date of the vehicle. Registration AAF 567 was issued between March and June 1934, so that is the date. 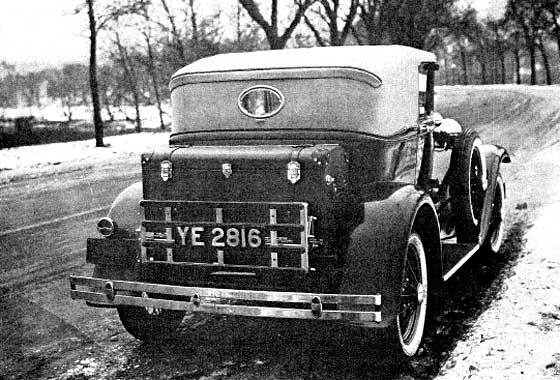 The make is Bedford who were by then based in Luton, who were a Vauxhall subsidiary, who in turn were a General Motors (USA) subsidiary (earlier trucks 'British Chevrolets'). The model is the WS or perhaps WT. Photograph from David Carmody (UK) which shows Count Plunkett campaigning cca 1917 for the first Dail in county Longford, Ireland. It would be very useful if this car could be identified. -- Unfortunately identification has not been possible because the all important radiator is hidden and bodies may have been made by external coachwork companies. If British then NOT Humber, Wolseley , Sunbeam or Napier, Star, Crossley, or Argyll. Poss Belsize or Darracq. American, Cadilllac?